Here in Texas there is no reason to use a dryer 95 percent of the time. Clothes dry quickly outside, even in the winter. And we've already established that it never rains here. After moving to our house with a backyard perfect for taking advantage of line-drying, it was a good four months before we finally strung up the line, got clothespins, and stopped using the dryer . My excuse? The newborn days. Our delay in abandoning the dryer coincided with our adjustment to our new role as parents. 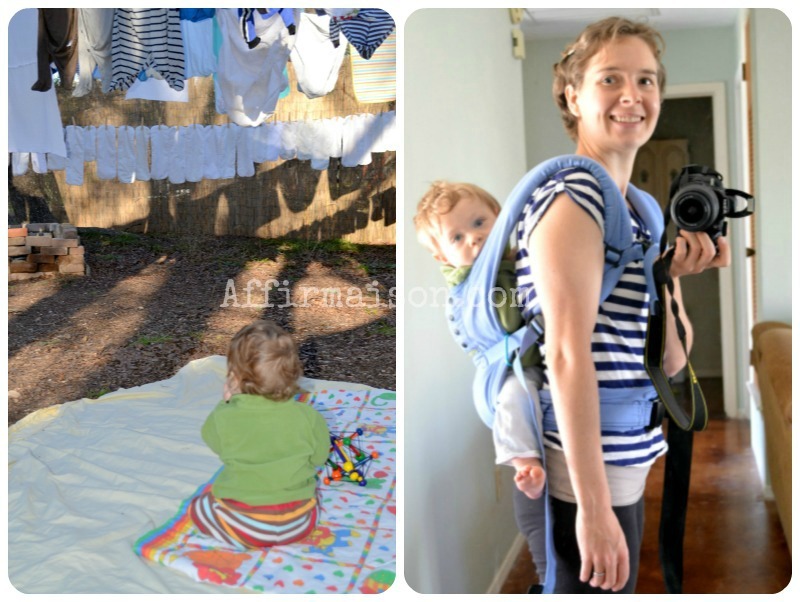 In those first months the thought of not only having to wash diapers every day, but to hang them out to dry, was too much for my sleep-deprived self to handle. In mid-October, I came across Erica's post encouraging her readers to unplug the dryer for the rest of the month. By that point we had started to settle into our new normal and I thought, "I could do that. In fact, I have been meaning to do that." I did not literally unplug the dryer as she suggested, but I did start hanging our clothes up to dry. I expected to find it arduous and irritating, but in fact, it has turned out to be quite the opposite. I find it relaxing and--dare I say it?--fun. Yes, it is repetitive, and yes, it takes time. But when I am out in my beautiful backyard methodically putting the clothes on the line, I often think of Payne Hollow and Harlan Hubbard's response to people who question his desire to garden by hand instead of using labor saving devices: "I will get the work done in my own way. Save time? The best use of time is the enjoy it, as I do when working in peaceful silence." When HP was younger he would sit in his bouncy chair outside while I hung the laundry. Around seven months he graduated to sitting on a blanket near the line with a few toys. When he became mobile and regularly left the blanket to consume fistfuls of leaves and sticks, he moved to the Ergo. In the front-carry he would constantly grab the line and try and pull the clothespins off. Now that he has graduated to the back-carry he happily looks around as my backpack while I pin the clothes (though he does still try to grab the line and clothespins if he is within reach). I love that not using the dryer saves both energy and money, but I also like that HP sees us doing physical work around the house. So often the work today is done by machines or in front of a computer. I think young children benefit from seeing work being done that they can imitate and eventually participate in. It gives them a more accessible way to see how things work. Of course I do not apply this rule across the board--I have no intention of abandoning our washing machine and doing our laundry by hand. I did that for the six-months I lived in Senegal and The Gambia. Surprisingly, even that was less difficult than I imagined and did not feel like a burden at the time. Even so, I am not eager to wash our entire family's clothes--including a load of HP's diapers every two to three days--by hand. When I started hanging our laundry outside I told myself that if I ever found it too stressful I would switch to the dryer. I did not want it to become an added source of stress in my life. Luckily, it has not been. I do occasionally use the dryer when hanging the clothes up just feels like too much on that particular day or if it is raining and the diapers can't wait an extra day. Even allowing myself those exceptions, our dryer comes on less than once a month. I know foregoing the dryer is not for everyone, but I am glad we have. It saves money and energy, gives me a reason to be outside enjoying my backyard, lets HP see real work being done, and is relaxing in its own strange way. If those reasons aren't enough, just look how lovely the clothes look strung up on the line! I'll be thrilled when I can finally have a clothesline for drying clothes. I hate using the dryer, but with a small apartment and little space for having racks up for long periods of time, sometimes it seems necessary, or at least far less troublesome than the alternative. That said, I have seen some awfully nice drying racks with lots of space for clothes recently, so maybe this is a case of having better tools making the job easier, but having them outdoors would be even better to my mind. 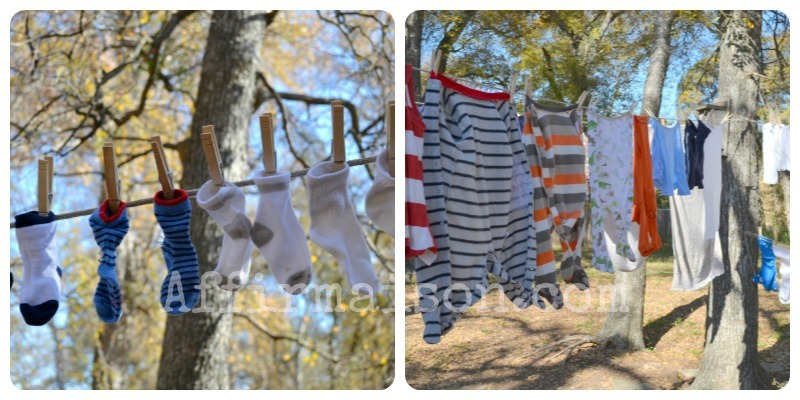 Being able to hang clothes outside makes it much easier and less stressful than trying to find space inside! I know we could have done it in the apartment with a drying rack, but as you said, space is a premium in apartment living. I will say I was surprised that our single drying rack (found next to the dumpster) could hold an entire load of laundry. If I had known that I might have made more of an effort in the apartment, but when I am honest with myself, I think I would have found it too irritating.